My daughter Natasha meets colleague and close friend John Stanton for the first time. I was thrilled to see them chatting away like old friends over lunch. 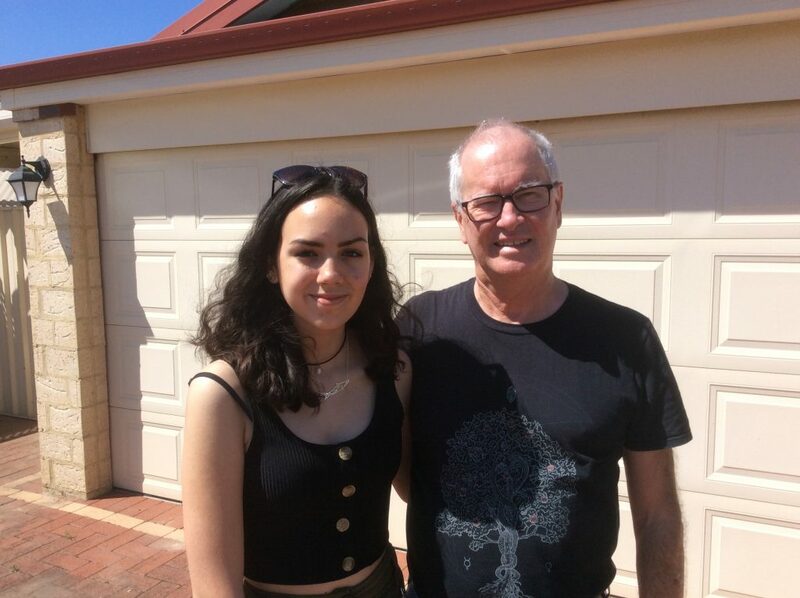 I wouldn’t normally have taken such a long break from the website, but I wanted to devote myself fully to my youngest daughter, 14-year old Natasha, who was visiting us from the UK. Sadly, I became separated from Natasha and her two brothers soon after her birth, and I now live on the opposite side of the world to them. I try to see them as much as I can, but obviously opportunities have been limited by the expense of flights and other costs when I am in the UK. At least I have the consolation of being able to Skype/Facetime them, but of course it’s not the same as being face-to-face and giving them a good cuddle. As you can imagine, I have found it very difficult not living with my children and seeing them grow up, and particularly when they have struggled in their daily lives. Every morning, I think of them. At times, it has just ripped me apart emotionally. However, at these (and other) times, I remember how lucky I am compared to all those Aboriginal parents who have had their children taken away from them by government over the past generations. Can you begin to imagine what it must be like to have your child removed from you? And then not be told where they are? And possibly not see them for years and, in many cases, never see them again. The impact of these removals on Aboriginal parents and on their children has been devastating! The issue of these child removals—the Stolen Generations—is a core element of our Carrolup project. Over the years, I’ve been working in the addiction and mental health field, I’ve come to appreciate the healing power of Story. However, I’ve been wary of strongly negative Stories, since negative narratives can be disempowering. I believe that we must create positive Stories to give people hope and a better understanding of how adversity can be overcome. Of course, when telling such Stories we can also include negative elements, but we must be careful not to create an ‘environment’ of negativism. To me, The Carrolup Story is a powerful positive Story, the type of which I have been looking for over a long period of time. It shows how the traumatised children overcome their adversity and in doing so reveal their remarkable talents. It provides important insights into how adversity can be overcome. It is an inspirational Story which can have an important impact on the world today and on future generations. It shows us the adversities that Aboriginal people have faced over past generations. It still surprises me how so few people know about this Story. It is time for that situation to change. That is a challenge that John Stanton and I, along with our collaborators, have decided that we must take up. To do this, we must research the Story, write and film elements of the story, and disseminate the Story in a wide variety of forms. We must engage people, not just as an audience, but also as active participants (e.g. as story-tellers, or ‘distributors’ of our work). To date, we have been researching the story, and working through a wealth of documents, letters, newspaper clippings, etc, as well as photographs and old (and new) film. Some of this content is being used in an eBook that has nearly been completed. We have developed the first stage of our Storytelling, Education and Healing online resource, which we hope you like. Continuation of our blogging and a second stage of development of our Storytelling, Education and Healing online resource. Publication of The Aboriginal Child Artists of Carrolup in eBook format. Production of a feature length documentary based on the book. Fundraising to enable the production of our documentary film and related activities. It’s going to be a busy year for John and I! Finally, back to Natasha. We had a very special time together and it was lovely to be able to spend quality time with my little girl (not so little now), and for her to be able to interact with her Australian family and friends. She swam with dolphins, had surfing lessons, held a koala and did lots of other things. I got to be a ‘dad’ again and I got a Cwtch (pronounced ‘kutch’)—a Welsh cuddle—most days. Perfect!